As the technology becomes more mainstream, many higher-education institutions are deploying cloud-based videoconferencing to enrich learning. Cloud-based videoconferencing has taken communication to a different level. Almost all industries are leveraging this technology to improve communication and collaboration while reducing infrastructure costs. The education field is no exception. As the technology becomes more mainstream, many higher-education institutions are deploying cloud-based videoconferencing to enrich communication between faculty and students. Students are already accustomed to videoconferencing as a way to connect, communicate, and collaborate with their friends and family, and this comfort level is now making its way to the classroom, during regular class hours and beyond. In fact, many institutions are also using this channel to recruit and work with international students. One reason behind the rising popularity of cloud-based video technology is that it is more affordable, reliable, and scalable than an in-house system. Considering recent trends, many now believe cloud video systems are likely to become the preferred communication channel in the coming years for most schools, colleges and universities, big or small. And they’re using this technology in ways that make both teaching and learning more exciting and innovative. For example, Birmingham Southern College in Alabama used cloud-based videoconferencing to bring the lights of Broadway to its classroom. Literally. Students studying acting and theatrical arts were able to perform for a New York City director—remotely, via video—on a five-hour live musical theater audition when the consultant suddenly could’t make it to the campus. The University of Southern California in Los Angeles has been at the forefront of the videoconferencing movement, and has been using videoconferencing to deliver live classes to students who are working as local defense contractors since 1972. Stop and think about the challenges they faced 30+ years ago! Needless to say, with the many innovations and advancements that have occurred in just the last few years, cloud-based video technology has made things smoother and more seamless for the program. And the University of Oregon library system deployed broadcast and videoconferencing in order to connect in real-time with its various campuses throughout the state, expanding its boundaries way beyond the classroom. Even though all these universities had different reasons to implement videoconferencing, there is one common thread—distance learning, and how cloud-based video technology has provided new ways for teachers and students to address its challenges. Quality videoconferencing allows for improved interaction, regardless of distance. K-12 and higher-education institutions can now provide educational programs to students outside the classroom in a way that was beyond our imagination even a few years back. Through HD videoconferencing and virtual classrooms, students, teachers, and industry experts can be brought together for rich, collaborative learning experiences. Schools, in turn, are generating dynamic content to further enhance the levels of education they can provide. Students and faculty can access the content and participate in virtual classrooms from anywhere, at any time, and use any device. The experience is like being there in the classroom because the videoconferencing tools allow for real-time communication. Students can ask questions, share ideas, or get specifics on the spot, with no lag time. Videoconferencing also lets schools and universities dramatically increase class size because physical space is no longer an issue. The technology allows for a larger reach while keeping the interactions seamless and class sizes manageable. 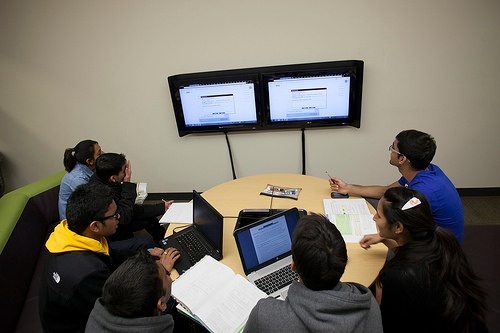 Videoconferencing in education combines the best of both worlds in both distance teaching and learning, and conventional education operations, allowing students to benefit from the easy-to-use class materials with a distance program, while enjoying the face-to-face meetings and lectures that are typical in conventional education. This can also make students more responsible for their own learning by doing tasks beyond the classroom and working in groups to add another dimension to conventional teaching. As new communication channels gradually blur the lines between conventional and distant learning, colleges and universities are using video technology in both environments. However, the prime pedagogical issue lies in understanding the impact cloud-based videoconferencing has on the effectiveness of learning. One thing is certain, videoconferencing can successfully lessen the time and distance constraints sometimes faced in the education industry, allowing students and teachers an enriched and robust collaborative experience.